Our intrepid explorer Rick has crash-landed his plane in an Amazonian rainforest and has to escape the nasty Goolu tribe. This won't be easy, and right from the word 'go', there are various nasty traps lying to catch you out – as well as those Goolus. From there, Rick moves on to an Egyptian pyramid where he must recover the stolen jewel of Ankhel, and then it's on to a castle to rescue some prisoners, before blowing up the missile silo where the enemy is based – it's all in a day's work. The excellent cartoon graphics are what makes this game appealing, and although there are traps at every turn, it's not frustrating – it has that 'one more go' factor. See also: Rick Dangerous 128+, Rick Dangerous II. 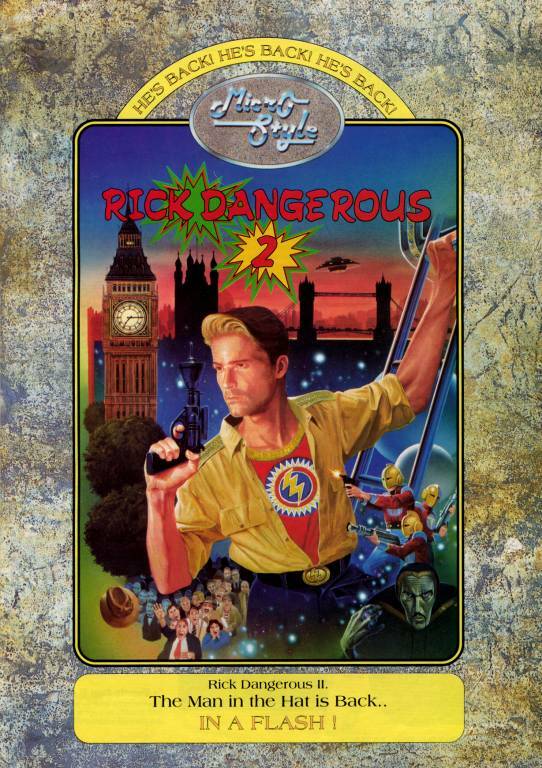 Rick Dangerous, the original CPC game released by Firebird in 1989, was a much loved and very fun as well as frustratingly addictive game. 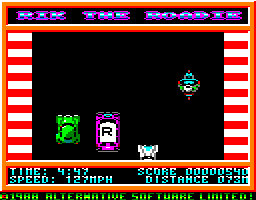 Amstrad Action awarded it a Rave with an overall score of 83%. So as a tribute to the original, 20 years later Fano, BDCIron and MacDeath got together and produced a stunning remake for 6128 Plus machines. There is a cool new loading screen, and the addition of an options menu to configure the game is great. Other extras included in this remake include the famous digitised "Whhhaaa!" 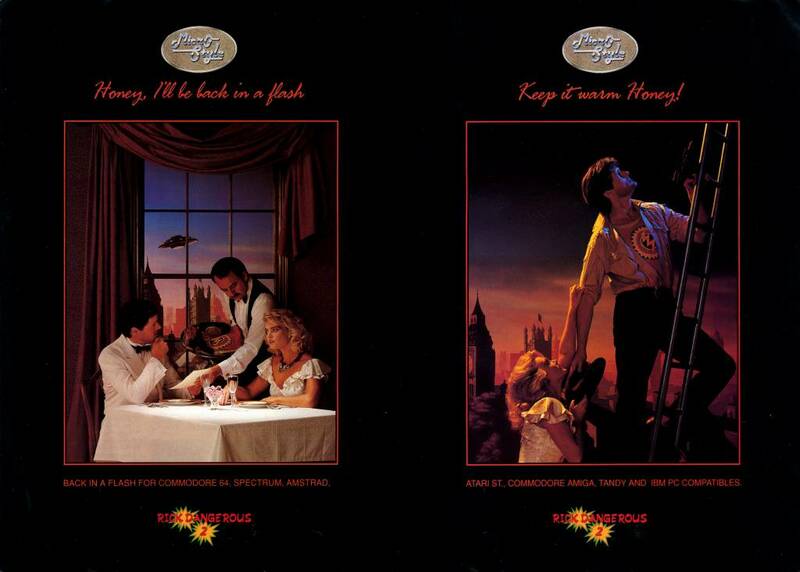 sample at 15kHz, full levels from the 16-bit versions, cool cutscenes with graphics from the Amiga version, music from the Atari ST version, redrawn tiles and sprites, and additional artwork. A fantastic job and still as fun and frustratingly addictive as the original. See also: Rick Dangerous, Rick Dangerous II. 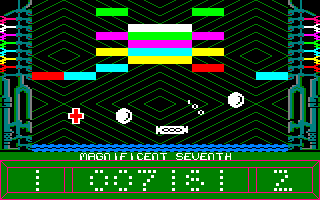 The first thing I must mention about this game is that it has the honour of being awarded 97% by Amstrad Action, which is the highest rating they have ever given – and it definitely deserves it. Rick now faces a new challenge from aliens who have landed their UFO in Hyde Park. After that, he visits the ice caverns of Freezia, the forests of Vegetablia, and finally the Atomic Mud Mines. 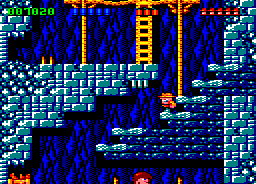 Unlike the original, you can complete these levels in any order you want, although in order to play the fifth and final level, you will need to complete all of the first four levels. The graphics are just as cute, and there's some great music this time, too! It's got everything that the original had and more, and it's well worth playing. See also: Rick Dangerous, Rick Dangerous 128+. This is based on air hockey, except that you shoot at the puck to make it move. The goalmouth is quite narrow, and your finger will probably become sore as you frantically unleash a hail of bullets at the puck. The first person to score a set number of goals wins the game. There are several features that can be customised, and you should definitely change the collision mode to 5, otherwise it's impossible to score goals. Unfortunately the other collision modes make the game either too easy or too hard, and the appeal is somewhat limited. The music is surprisingly good, though. Can you break down the jammed safety forcewall using two free-floating mega-neutrons, without letting them touch the fuel core? Oh, you knew this was a bat and ball game, right? Well, I think everyone knows what to do, so let's just say that the graphics, while colourful, are poor; the bricks don't even deserve the name – they're just big, blank rectangles. 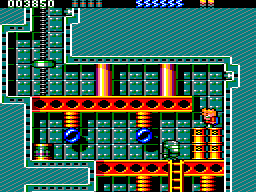 Nearly all the sprites are monochrome, giving a very Spectrum-like feel to the game. It's a bit easier than most Breakout-style games, but the graphics and a lack of extra bonuses let it down very badly. It's time to go canoeing down the rapids. Navigate the four courses and try to beat the record time on each one, manoeuvring your canoe through the pairs of flags and pitting your wits against the fast-flowing river. On some courses, you'll even have to go through some of the flags backwards! Time penalties are given to you if you miss any of the flags or fall into the river. 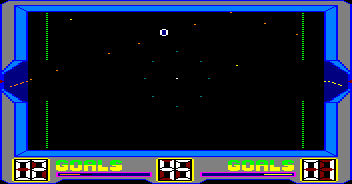 Unfortunately it's not really all that good – the graphics are rather basic and very flickery, and there's not all that much challenge involved. If you've got the patience, though, there is a course editor included with the game. 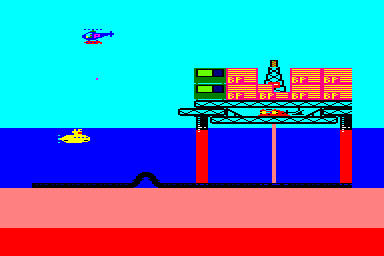 The oil rigs are under attack from enemy submarines, and you must shoot them in your helicopter. Unfortunately, they are equipped with long-range missiles, while you only have short-range bombs, so you'll need to fly close to the sea to hit them successfully, which obviously leaves you exposed to enemy fire. Flying this low also means you might fly into the oil rigs if you're not careful. 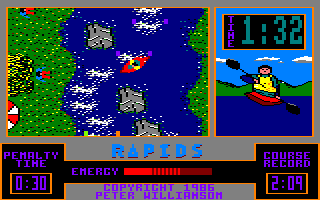 The graphics are nothing special, although the multi-coloured border is used to good effect. The sound effects are sparse, while the actual game is just too hard; it's too difficult to hit the submarines, and they move too fast for you to hit them accurately and get out of their way. The colony of Rigel V is at war. You are Harper, a journalist who has been told that the rebel fighters, the Rigellians, have a doomsday device that is capable of devastating the entire planet. When you arrive in the city, you meet Elliot, the man who told you about the device, but he is badly injured and dies. You must find the rebels' headquarters and disable the doomsday device – but you'll need to find your night goggles first... 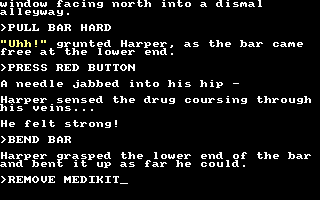 This is a text adventure which has a lot of atmosphere and describes the starkness of the city quite vividly. Harper has to watch his step at every turn, encountering booby traps, mines, bombs and snipers. This is a great adventure with some neat humour as well, but be aware that some copies of the game contain a bug which makes the second part unplayable! It's a great life being a roadie, isn't it? Driving down motorways at more than 100mph to your concerts, lugging equipment around, and making sure it all works. This is where you get a taster of what it's like. In the first part, you drive your purple van down the motorway, avoiding the traffic. The second part is where you have to shift the equipment to the concert hall, and the third part involves getting the volume levels correct without blowing the fuses. 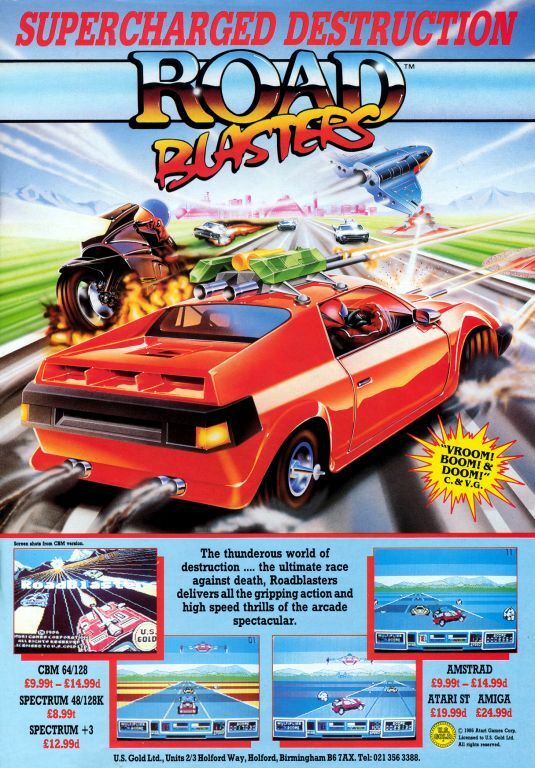 This game appeared on the Amstrad Action covertape and its readers unanimously considered it to be tosh – and I agree with them entirely. This is what rallying in the future is like – 50 stages to complete, all laden with hazards such as mines and gun turrets, as well as other cars and motorbikes which you can shoot. 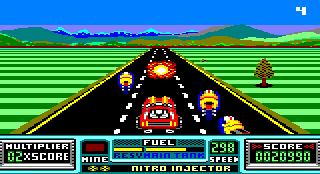 You also need to collect blobs of fuel or you'll run out, and on some stages, a helicopter comes along to give you a power-up such as a U2 cannon, cruise missiles, or nitro injectors. The graphics are pretty impressive and the music is good, but all the stages are too long, the whine of your car's engine is irritating in the extreme, and provided you do well in the early stages, the game becomes a bit easy.